With just 117 words it shouldn't take much effort to show this up for the sham that it is. Woah, let's stop right there. 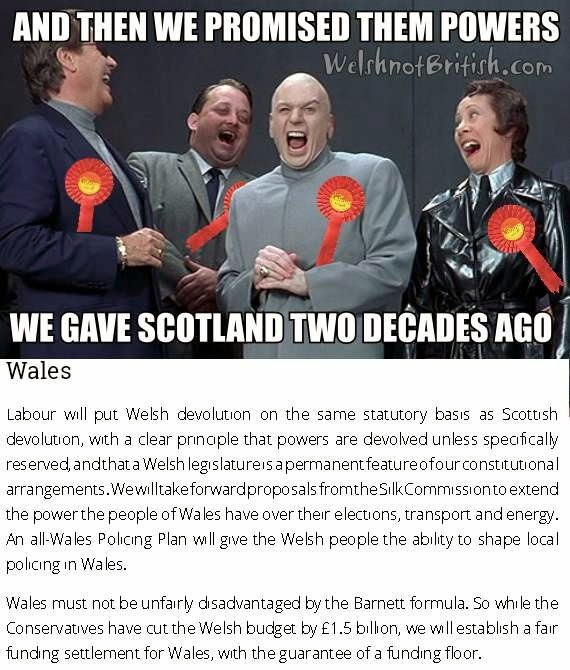 Labour are now promising Wales the same powers that Scotland had two decades ago despite the fact they were running the UK government up until 2010 and could have done so at any point during that time. In fact before the 2011 referendum the limited powers we did have meant that whatever laws we wanted to make had to be signed off by our masters in London first. With reference to Scottish devolution it also doesn't state whether they are referring to Scottish devolution as it is now or as it will be should their jam tomorrow promises of more powers to Scotland actually happen. We'll have to guess it'll be as it is now. with a clear principle that powers are devolved unless specifically reserved, and that a Welsh legislature is a permanent feature of our constitutional arrangements. Well it'll be nice not to have our new laws challenged in the courts by our masters in London but the bit about making the Senedd permanent sounds too good to be true and that is because it is. Labour are promising us things that can only happen if they are able to get the bills through parliament. Even if Labour get a bill passed making the Senedd permanent it could always be overturned at a later date by a different government. It's like the former Labour Home Secretary Jack Straw said, "power devolved is power retained, not ceded". We will take forward proposals from the Silk Commission to extend the power the people of Wales have over their elections, transport and energy. 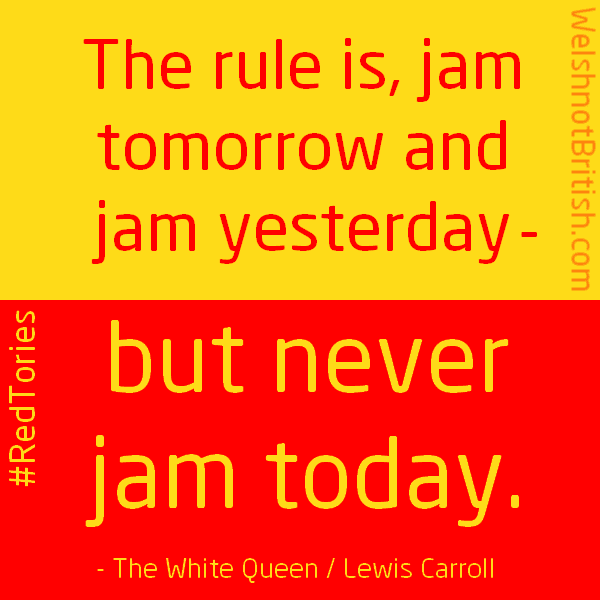 Now we're getting to the crux of the matter, the promises of jam tomorrow. And the one that stands out for me is the promise of Wales having control over its power. The reason it stands out is because back in 2011 all but one Labour MP in Wales voted against devolving energy to Wales. And that's not all they have voted against. During the last parliament the Labour MPs in Wales have voted against devolving Air Passenger Duty, voted against devolving full control over Welsh water and voted against devolving The Crown Estates (part of the energy bill). An all-Wales Policing Plan will give the Welsh people the ability to shape local policing in Wales. Powers over policing but not over the justice system? No powers to stop paedos and junkies being dumped in Wales by the Englandandwales probation service. No powers to stop England building its new super prison in Wales which could have a devastating knock on effect on the Welsh NHS. The Barnett formula is so called because it was invented by the Labour politician Joel Barnett at the tail end of Labour's government in the late 1970s. You know the one that Labour's then Prime Minister James Callaghan believes was brought down by his own Labour politicians which in turn led to Thatcher becoming PM. Wales was run by Labour from 1997 (London and also from Cardiff from 1999) until Gordon Brown was kicked out in 2010. Despite all that time in office they haven't addressed the Barnett formula. Even Carwyn Jones, Labour's First Minister of Wales believes that we are being short changed by Labour's Barnett formula. As for the funding floor that could mean anything. It's been left deliberately ambiguous, either that or they haven't thought it through yet as they clearly weren't short of space to explain what it really means. So in summary then we have 117 words promising us powers we should have had two decades ago, powers that can be over turned at the whim of a future UK government, powers they have already voted against and powers that are essentially meaningless.